So a couple of weeks ago I was working on a project for a customer and decided I needed to use JQuery UI since I was going to have some popup boxes and wanted some pretty buttons. So I applied JQuery UI no problem, but forgot that it does not have a select box. Yeah I could work around it using Autocomplete or just try and style the select menu up a little with some css, but that would’t be very cross browser consistent. I figured it would be pretty simple to then bind a click event to my <a> tag. 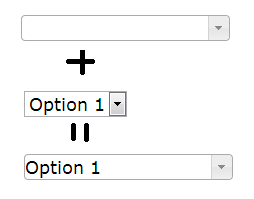 Which is a custom drop down arrow using jquery styles. Simple enough right? Well in actually there is a huge difference in programmatically triggering an event versus a user’s mouse triggered event. This is probably due to security concerns. So in my searching I came across this entry in stack overflow. One of the recommendations is to change the size of the select menu. This would work if you absolutely position the element and use the wrapper description I gave above. Now, this is a very reasonable work around but it has its downsides. The drop down list will not look like other JQuery UI elements when the drop down happens. Some css styling might make this work alright though. The size attribute can be a little tricky to get right. If your select list has 2 elements, making it a size of 2 will give a lot of white space. The <a> tag has to be in-front of the default drop down arrow, but the wrapper which creates the border has to be below the select menu so the default actions work on the select menu. Getting this position correct on all browsers will be tricky, but not impossible. The scroll bar is default and cannot be removed (might be able to apply styleing, but this wont be corss 100% browsers). In the end, it just doesn’t look quite right. And this is just in Chrome. Figuring out how to tweak styles to be good in all browsers will be a serious pain. Download the above example here. Please keep in mind, this was only for Chrome and looks bad in some other browsers. You will need to spend some time playing with the css, but in the end you should be able to get this working fairly nice. Also might be a great lightweight solution. So the above solution is pretty good and super simple. You are using the native select menu with a little bit of a hack. This is great, because all your events for the select menu make sense. But the down side is it has some issues looking polished and the drop down doesn’t really follow the other Jquery UI. So I needed to resolve these problems. My solution was to combine the css styling used above coupled with Jquery UI AutoComplete Widget. Use above css to make something that used JQuery UI css to look nice. Basically we will parse select elements, hide them and create our new css to make things look nice. Apply AutoComplete Widget to our styled drop down menu to give the illusion of a select menu. Why did I go this route? Use Jquery UI widget to hadle the heavy lifting of the select menu. I just need to write an API wrapper for AutoComplete widget to make it do a little more. In the end this was very simple to implament. About 100 lines of code and very straight forward. The real issues arose in event handling. The AutoComplete Widget API is ok, but frankly a little lacking. So working around its limitation and forcing it into my own needs took a little fiddling. Here is the example page. It takes a little while to load, but that is just the google scripts that I use to host it. Look at my post about how to host stuff for free on google scripts. If you have any questions let me know. The code should be pretty simple to step through on your own, but I would be happy to explain what I can.